Why do our finding aids look like finding aids? Like a lot of institutions, the online finding aids at the University of Maryland Special Collections bear a strong resemblance to their paper counterparts. The question is- why? Do our users have a particular affinity for our finding aid format? If we changed it, would there be massive upheaval? We don’t know, because we haven’t tested them. But there’s little reason to adopt a user-centered design approach to your finding aids if they’re not easily changed. The state of the data in our legacy system is such that it would be difficult at best. The move to ArchivesSpace and the cleanup of data that goes along with it gives us the opportunity to try out different finding aid layouts or features such as faceted search. Where is that collection, anyways? A combination of the lack of space for physical collections and the speed with which new accessions come in has often led to inaccurate or incomplete location information in the legacy system. There are also multiple collections that require the assistance of a curator to locate. These issues can lead to inconvenience for researchers, and frankly make us look bad. Because the implementation of ArchivesSpace has inevitably lead to a re-examination of the processing practices, there is an opportunity to look at how we shelve collections, and more importantly how we label their locations. It’s not a simple change- this would be a big project and require a lot of political will to get off the ground. But just as with thinking about changes to the finding aids, it is something that would eventually be beneficial to researchers (and, quite frankly, employees), and is therefore worth examining. Do Our Restriction Policies Make Sense? A tangential part of my project (in addition to thinking about semantic URLs) was looking at the default restriction language that was being used in finding aids and other places on the website. The combination of bland legalese and archival jargon was confusing even to the staff, which is disconcerting in an age where many of those who visit our website don’t ever set foot inside of our physical space. A lack of clarity in this area can cause trouble with both researchers and donors. In a lot of ways, this was the easiest part of the project. Everyone I spoke with agreed that the language should be changed, and most people had suggestions about how we could use more plain language in explaining our restrictions. I’m hoping that this is one change that can be implemented easily and without controversy. I was frankly blown away by the positive reaction to my poster at the SAA Annual Meeting. I spoke with a LOT of people. Many of them were in the process of implementing ArchivesSpace from their various legacy systems (Excel, Filemaker Pro, Archivists’ Toolkit, Access and Past Perfect were all represented). Most sympathized with the difficulties of cleaning up and standardizing their data, indicating that it was the toughest part of their project as well. I also met folks who were hesitant about moving to ArchivesSpace, despite their need for a data management solution ASAP. Some blanched at the costs and time involved, while others were concerned that the product wasn’t ready for primetime. These people didn’t strike me as change-averse or scared of technology. They just wanted something that worked and didn’t break their budget. It didn’t matter whether it was open source or from a vendor, as long as it met their needs. These interactions really drove home the whole point of this project for me. 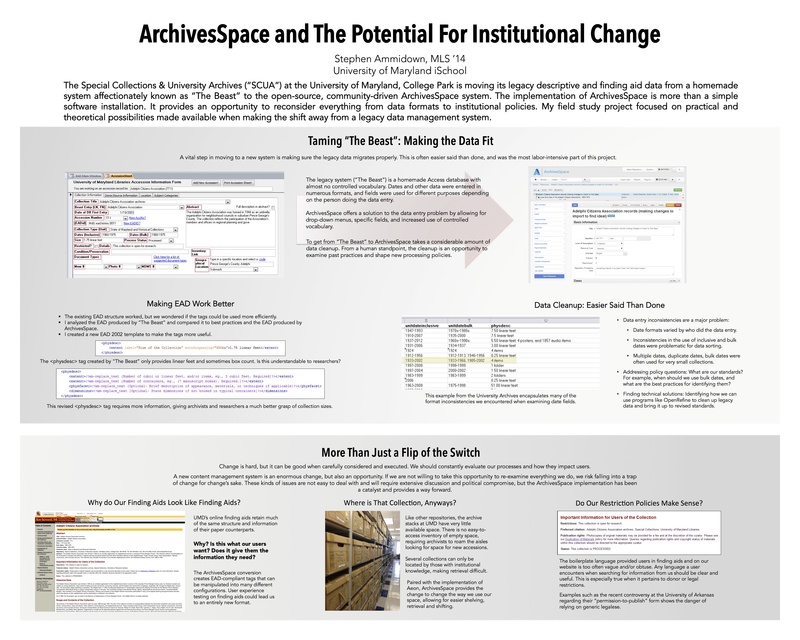 I sought out a project relating to a software implementation because I knew that while it wasn’t a core archival skill, it’s an issue today’s archivists need to grapple with as they work to serve their stakeholders better. And what I found shouldn’t have surprised me, but it did. This kind of change is HARD. As with anything, some people will embrace the difficulty of change, and some will not. But the opportunity for improving processes and better serving our stakeholders is too much to ignore. Whether it’s ArchivesSpace or something else, we need to constantly be evaluating our processes both online and off, and seeking ways to improve. We can’t let ourselves fall into a trap of caring more about our collections than our stakeholders. This is not a chicken and egg problem of which is more important- without researchers and donors and staff, our collections mean nothing. Songza and a victory for human curation?